Highway 12 in southern Colorado is one of Colorado’s Scenic and Historic Byways. The permanent travels both directions between La Veta and Trinidad, CO, covering nearly the entire “Highway of Legends”. 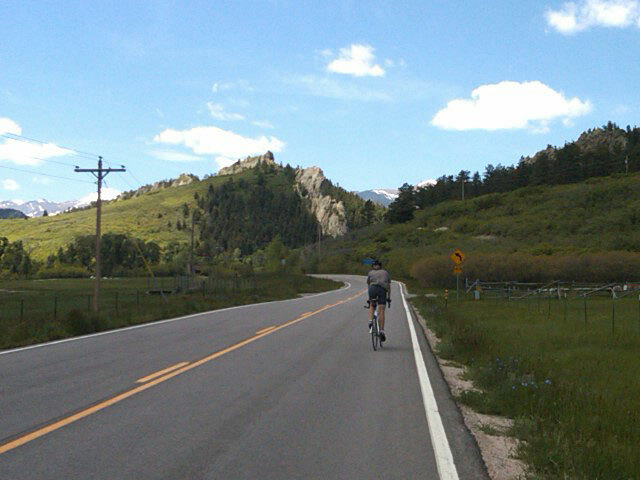 The populaire follows Highway 12 between La Veta and Stonewall. Most of the road is two lane with no shoulder, but low traffic. Both permanent and populaire riders will climb 9,900 foot Cuchara Pass from both directions. While a rural route there are some services. These include La Veta, Cuchara, Stonewall for all routes, with additional services at Trinidad and Segundo/Valdez for the permanent. Most riders will need to limit their time off the bike in order to finish within the time limit for either distance. There are three start options for the permanent and two for the populaire. Hopefully that will maximize time on the bike and minimize time in the car. Permanent riders can start in La Veta, Trinidad or Cuchara. The Cuchara start can be ridden in either direction, riding to either La Veta or Trinidad first. The populaire can be started from La Veta or Cuchara. Again the Cuchara start can be ridden in either direction. For riders that want to make a vacation of it, Trinidad is a 20 minute drive to the start of the Capulin 200k. To the north, it’s a 20 minute drive from La Veta to the Walsenburg start of the Bishop Castle 200k. If you prefer a supported ride and/or shorter distance options the Stonewall Century is held every year in August. Proceeds from that ride benefit local non-profits, including volunteer fire departments and the La Veta Library. There’s also a website devoted to biking all of Colorado’s Scenic and Historic Byways. All the routes are on public roads so there’s nothing preventing you from riding them as an individual. If you want to get credit for a permanent you’ll need to join Randonneurs USA (RUSA). Annual fees are currently $20. You contact the permanent owner before you want to ride. The permanent owner will send you route information and an official Brevet card which you use to verify your ride. You also need to sign a waiver prior to riding a RUSA permanent. Rocky Mountain Cycling Club has a brief introduction to randonneuring on their Brevets page as well as a 2014 Brevet schedule and list of all Colorado permanents. You can find more extensive information on the Santa Cruz Randonneurs website. The RUSA Permanents FAQ also has some good information. Permanents are unscheduled rides. Brevets and Populaires are scheduled events. RUSA has a search page for Permanents throughout the USA, as well as all scheduled RUSA rides. If you’re ever interested in riding Paris-Brest-Paris, RUSA is the only organization through which US riders can qualify for the PBP lottery.